I cannot remember when Mikkel van der Meulen gave me the tape, but it must have been around 1982. On one side was the first LP by Restless, on the other side the debut LP by the UK Meteors. I bought both records right away and played them to death. The Meteors played in Amsterdam the year next and that was one of the best concerts i ever visited. In those days i often bought cassette tapes of the shows that i liked, usually recorded by a guy in the back of the hall with a portable cassette recorder. The sound quality was always poor, but it had the atmosphere and i played the Meteors at De Melkweg tape quite a lot. Back then i wrote an article for De VPRO, who was planning to make a new magazine and asked several people for a contribution. The VPRO radio played a lot of music by The Cramps and never anything by The Meteors or any other Brittish psychobilly band. The Cramps were considered the inventors of psychobilly, but i think it were the Meteors who did this. The Cramps play trashy rock’n’roll, no psychobilly. I got the article sent back with a note that said that it was written in a bad style and that my idea was nonsense. 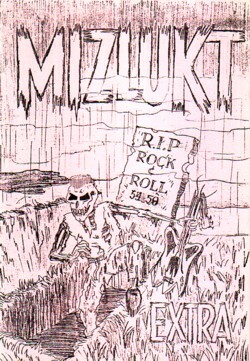 The those days i made a fanzine (??”Mizlukt”?? ) in which i wrote about all my projects that didn’t go nowhere, so i lettered the article, drew a cover for it and published it as an extra issue of Mizlukt. In fact, de VPRO payed me 150 guilders for the article, which was a lot of money, so the situation was pretty funny. I stopped buying LP by the Meteors after five or six albums. To my ears it began to sound like a sell out: the songs were no longer really good and also the musicians were not as good. The original bass player, Nigel Lewis, left the band after the first LP, and leadsinger/guitarist Paul P. Fenech, seemed to have forgotten how to play guitar like he did on the first two LP’s. Last week i saw a promo for an animation video that The Meteors had made and i found out that Nigel Lewis had released a new cd. The songs on the cd are surprisingly good and although i don’t like the story of the video. nor the lyrics of the song, it feels good that there still is life in the band that i used to love so much.